Ironically, profilers like Depue have become contemporary pop-culture archetypes, thanks to the novels of Thomas Harris and the bestsellers by Depue’s former colleague, John Douglas. This grisly science, though, wasn’t on the horizon in Depue’s childhood, when his policeman father was known to keep order via strong hands and a sympathetic ear. After a typical “delinquent” adolescence, Depue saw stints in the Marines and as a small-town cop, experiences that later became his ticket away from the drudgery and casual violence of the Midwest, circa 1960. His innovations as a police chief of 26 in hardscrabble Claire, Michigan, made him an ideal candidate for FBI recruitment. The bureau was shedding the Hoover era’s intellectual myopia: younger agents like Depue perceived that the drugs and strife of the 1960s would lead to a spike in violent crime that needed to be countered proactively. Depue’s FBI career began in the Deep South, where he personally witnessed the injustices perpetrated by the Klan and their police sympathizers, an experience that prompted his early support of racial equality. Later, he moved to Washington and worked extortion, kidnapping, and fugitive cases. 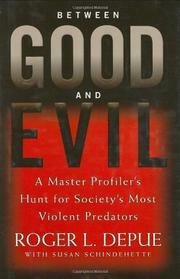 When his cohort at the bureau wondered how to predict the actions of child molesters, sexual sadists, serial killers, and other irredeemable types, the unit began interviewing offenders in custody, resulting in Depue’s surreal encounters with figures like Ed Kemper, an articulate, intelligent, 300-pound psychopath, or the glib and amoral Ted Bundy. Depue retired as head of the Behavioral Science Unit and started a private law-enforcement consulting firm that was called in on, among others, the JonBenet Ramsey and Columbine cases. When his wife died of cancer, he entered a seminary for several years and even worked with convicted felons, feeling an intense need to confront issues of good and evil in a different way from before. The collaborative prose here is workmanlike, while the combination of grisly crime story with Depue’s personal journey is quite moving.